"Meanwhile, back at the ranch," my mum used to say that often when we were kids. It was like she was saying, let's change up the subject. Shift conversational gears. Get back to that other story. So, meanwhile, back at our ranch. Let's take stock shall we? This fall has been beautiful. With wonderful weather. Gorgeous autumn colours. Warm temperatures. And lots and lots of those sunny crisp days that we all love. Yep. It sure has been a lovely fall. And I sure am glad that it's over. Because, dear readers, all that stuff that I told you about in my post at the end of September. 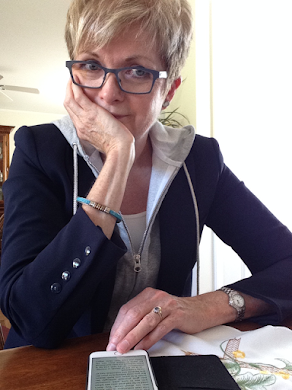 About Hubby's shoulder injury, and his subsequent surgery, and my incompetence as a nurse, and my angst over that, and finally my horizontal ingress into our den... flip-flop instigated, tea-flying, rib-bruising little incident. Well, all that was just the beginning. Let's stop here, shall we? And admire this shot of the corn fields along one of our favourite walking routes. The beautiful fall trees beyond. And the blue, blue sky. Notice those storm clouds blowing in from the east? What was it Bert said in Mary Poppins? Something about "wind's in the east?" Yep. Lots of east wind blowing around here this fall. So. Anyhoo, where was I? Oh yes. By late October, Hubby was making a good recovery. He was looking forward to his six week recall exam with the surgeon, getting his sling off, being able to drive, and finally starting his rehabilitation. On one of those beautiful, sunny, fall mornings we set off for the follow-up with the surgeon. And in the vein of taking our treats where we found them, we stopped for coffee and breakfast on the way to the appointment. Yeah. The appointment went well. The surgeon told Hubby that even if the tenuous one third of the repair did not hold, the other two thirds was solid. So the worst case scenario was that he had the potential to improve his pre-surgery mobility by 75%. Yeah, again. We'd certainly settle for that. And the best part of the day was Hubby emerging from the examination room, with his sling stuffed into his coat pocket, grinning from ear to ear. His first appointment for physiotherapy was already booked for the next day. No point dilly dallying. Maybe we'd be canoeing next summer after all. 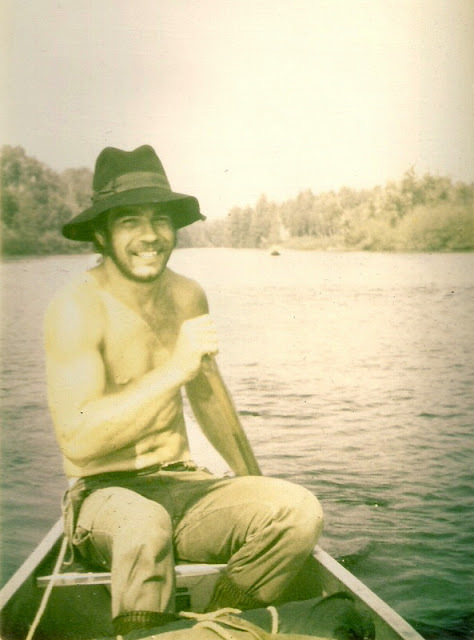 Hubby paddling on the Des Moines River, 1974. And on Friday, feeling like maybe we were on our way to getting our lives back, we set off together to shop for speakers for the television. And so we were at our local, recently opened Best Buy that morning, where it was clear that they were still setting up the store. Because otherwise, why else would they have a large end-of-aisle display unit, one of the ones designed to hold big stereos, or something large enough to require a single shelf that jutted three feet out into the aisle, at a height of only six inches off the floor... and... and... which was completely empty? We followed the clerk down the aisle, Hubby walking beside me. The clerk pointing to the next aisle where the speakers we wanted were found, as he rounded the end of the aisle taking the corner wide. I followed him and Hubby, beside me, cut the corner. And came to a dead stop when his ankles hit the empty shelf of that end-of-aisle display. Well, his feet stopped. The rest of him didn't, of course. He pitched forward. Both feet left the floor. And somehow, in the few seconds that it took him to fly through the air and hit the floor, he managed to bend his right arm, grab his right elbow with the left hand, pull it into his body, and twist himself so that he landed on his left side. Hard. On his shoulder. And he lay there for several minutes, grey in the face with shock. And anger. Complete and utter disbelief. And pain. Thank god it wasn't his right shoulder. The one which had had that complicated surgery, which had just spent six weeks in a sling... well, you know. Finally he struggled to his feet and looked at me and said, "Suz, what the hell is going on?" I knew what he meant. It was like the universe did not want him to get better. So after a trip to the emergency room. X-rays. And a thorough examination by the physiotherapist who was already treating him for his right shoulder. We learned that he was bruised (badly), but not broken, or torn. And he had not re-injured his right shoulder. We'd lodged an immediate complaint with Best Buy and, I must say, they've been very good. From the shocked sales clerk, and the very attentive store manager, to the polite and obliging insurance adjuster, they've all been helpful. And they'll be paying for the physiotherapy. Which is good. But still. Less than a week since we had had such good news... both shoulders now were in rehab. And meanwhile back at the ranch. The weather stayed beautiful. And we walked. A lot. It's the only exercise Hubby can do at the moment. He goes downright stir crazy if he can't exercise. We explored new trails. And walked trails that we'd skied last winter. Or biked on last summer. We drove further and further afield looking for new and interesting places for our walks. The next week looked to be a busy one, doubling up on physio appointments, now. And on Monday, Hubby emerged from the shower, frowning. Something was not quite right. Besides his shoulders, that is. So, a trip to our family doctor later, we found out he had a hernia. Probably partially caused by issues with the heavy duty pain meds he'd been on after the shoulder surgery. And now, there'd be more surgery. Damn. Probably scheduled for February, our doctor said. And then... a month without driving or lifting. Well, we knew the drill. But. Then... our lovely, young GP listened to Hubby. He does that ... which is why I think he's lovely. And between them they decided that if the surgery could be expedited... and the two rehab times run concurrently...well, wouldn't that be better emotionally for everyone? So our GP made some calls, and called in some favours, we imagine. And the surgeon's office called on Thursday. Could Hubby see him tomorrow, Friday, for a pre-op appointment? With an eye to having the surgery Monday? He could. He did. Wow. Surgery within a week of diagnosis. Might as well get all the pain over at once. I hear that the nurses and doctors... and Hubby... had a bit of a chuckle the morning of the surgery. Trying to find a way to lie him on the table that did not interfere with his recent right shoulder repair, or his still severely bruised left shoulder. The anesthetist for the surgery was our former family doctor (a friend of our current family doctor) (they're both lovely, by the way), the surgeon a friend to the other two. 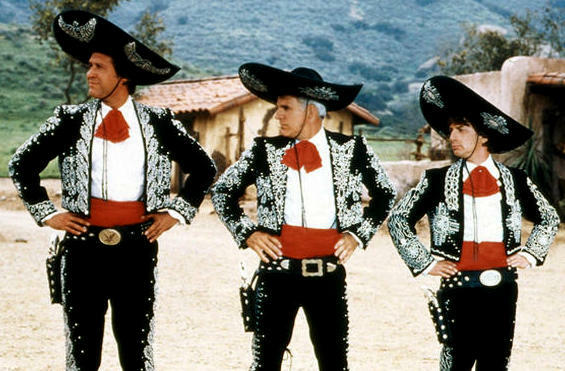 Hubby quipped that it was too bad our current GP had not been there for the procedure... it would have been like being operated on by the "Three Amigos." Ha. We both loved that silly movie with Chevy Chase, Steve Martin, and Martin Short. So meanwhile, back at the ranch. This is Hubby and me, on our wedding day. July 1989. 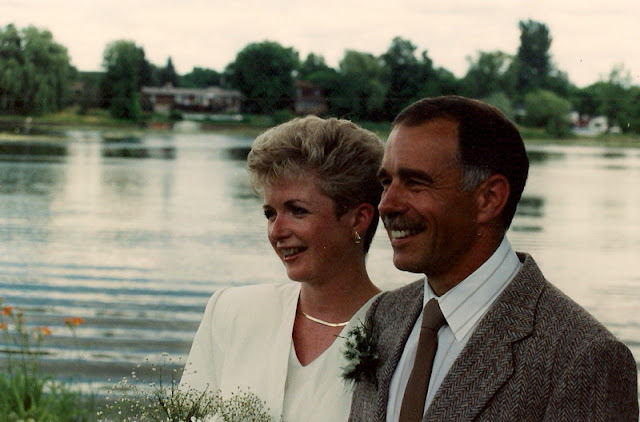 We were married on our deck; this shot was taken by my brother-in-law on our front lawn. The weather in the weeks and days before had been hot, hot, hot and drippingly humid. But the day of the wedding dawned sunny and a perfect twenty-two degrees Celsius. I actually wore my suit jacket all day long, and my mascara did not run down my cheeks in sweaty rivulets as I feared it might. It was pretty much a perfect day all round. 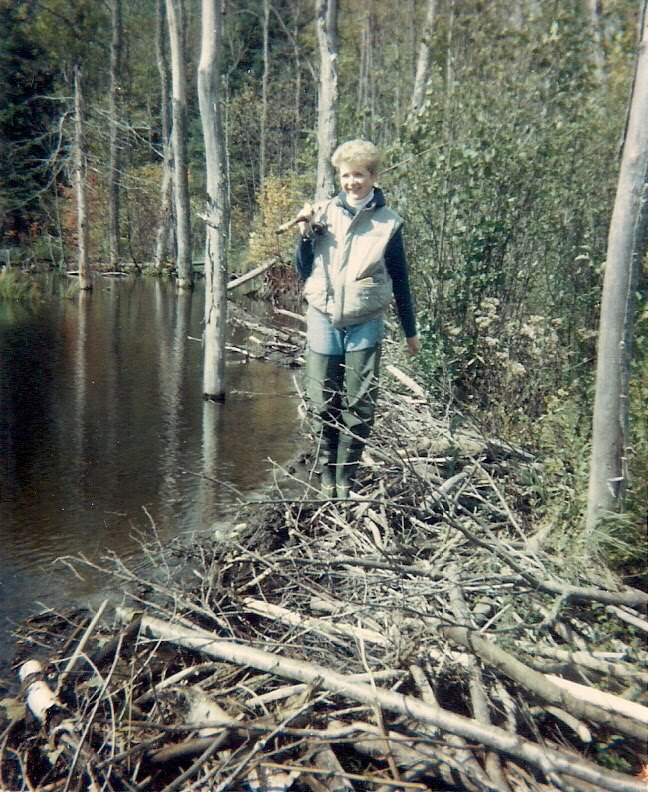 Boy, a lot of water has flowed down the Rideau since then. Our wedding day in July 1989. So. Let's continue with the autumn stock taking, shall we? All told... three months of probably the best fall weather we've had in years. One long anticipated surgery. One totally unanticipated surgery. One very, very unlucky tumble. Well, two if you count mine. Many painful days for Hubby. A few for me. Two trips to the emergency room. Two different surgeons. One wonderful physiotherapist... and too many appointments with her to count.... because we're far from finished with those. And let's not forget... all that walking. I must add that a few days after Hubby's second surgery, my mum called and said, "Susie. I've been thinking. How does Stuart get out of bed in the morning?" Hmmm. Good question, Mum. Can't push himself up with his right arm yet. Couldn't at the time with his left, either. Can't use his abdominal muscles. Well. It's kind of a sliding, slithering motion. And then we laughed. Ruefully. Late November on the Rideau. So fall is pretty much over. Thank goodness. Hubby's physio on his left shoulder is finished, the bruises pretty much faded. He continues to work on the right, and will for some months. Rehab progress after shoulder surgery is notoriously slow and complex. Everything else is good. You know, I may get so that I like late November. All those wet, dreary days. The leaves gone. Darkness coming early. Good for building a fire and hunkering down. Flock after flock of Canada geese glide over our house and land on the river every evening. I can hear them honking as I sit in the den writing this post. Sipping a glass of Pinot Noir. The smell of dinner cooking wafting around me. Because, you know, a side effect of there being no hockey, or biking, or canoeing, or skiing for Hubby, besides all that walking, is that he's totally bored. And when he's bored. Well.... he cooks. And plans new and different things to cook, and, now that he's back driving, he also shops for all the groceries he needs for all those new dishes. Sigh. And I let him. I'm good like that... small smile here. Silver lining, people. Silver lining. Have a listen to this wonderful rendition of the song "Meanwhile Back at the Ranch" played by Roger Paulsson. Excellent, late November, mellowing-out music. What a story! Thankfully, there is a silver lining to it. And I really liked the music too. Well... silver lining for me. That music is great, isn't it? You are a talented storyteller. I was on the edge of my seat, in the Best Buy shop just waiting for the punchline. Hope everything improves for hubby and meanwhile, enjoy the cooking. Why is it always.......so many things at once? I love to read your stories. You are a very talented story teller., but I wish some of this was fiction. But on the bright side, good books, good food make life so much better. Hope healing comes soon. I wish it were fiction, too. Or that I was even just exaggerating. Good books and good food certainly help. Thanks. Thanks, Jenn. Monsoon is a good word for it! Darn. Wish I had thought of that! The perfect song for this story...I'm humming it now... "Life's a piece of..." you know. Oh dear! My heart was in my mouth until the denouement - what bad luck! All the best for a good recovery - with no further mishaps. By the way - love your wedding photo, I love that your husband wore a tweed jacket for your outdoor, riverside wedding. Thanks Patricia. Our wedding was very casual. Plus, Hubby kept saying he did not "need" new suit. His tweed jacket was still good. He hates buying clothes. You guys have really been through it. Enough already, right? Your perspective is wonderful, and so glad you have each other. I'm not sure how you manage to remain so sanguine and have a sense of humour to boot! Glad you do, because it's very entertaining, but wow! that's a lot of tough stuff to get through in a few months. . . Crossing my fingers super-tightly that you both get the balancing side of whatever the universe has been aiming your way. And very soon! Thanks Frances. But don't be fooled, I'm not always so sanguine. I've had a few pouty days. A few days feeling sorry for myself because this is definitely NOT how we had envisioned life after my retirement. All those many things that we talked about when I was still working..Stu going..."Just think when you're retired we can... whatever." Most of those things are on hold. No travel for a while. But..we did have that lovely trip to France in May. And we're grateful that we've been plagued with injury and not disease. Knock on wood. And the blog has really helped me...whenever something dire happens I just focus on how to make it into an ironic blog post. Silver lining again, I guess. Oh my! I feel like we've been leading parallel lives. We've had a foot sprain (mine), knee problems with a replaced knee (hubby) that thankfully turned out to be only a soft tissue problem, and not a failure of the "device" as we'd feared. Best of luck. We've done the hernia thing (hubby) twice--no fun, but easier than recovering from a joint problem. Wished we lived near each other--we could commiserate over a pot of tea! Thanks, Maggie. Hope your respective recoveries go well too. Thanks Regina... for the kind words... and the good wishes. OH My! What dreadful goings on! You have such a positive through it all though. Wishing your husband a very good recovery! Thanks, Paula. You gotta laugh... much more fun than crying. Love the Roger Paulsson music. I've never heard of him. I wonder where I can get his music? Couldn't find it in the usual places like Pandora, ITunes, Spotify or Amazon. Any suggestions? It's great isn't it? I found his song on Youtube...but I have no idea if it's available in other places. Sorry. Please give "Hubby" my best wishes for a speedy recovery. Wishing you both a restorative December and a 2016 filled with lots of healthy outdoor activities. I envy your varied walks right now. Especially as it is so dark before 5 pm! I will Heather. We've had great walking weather this fall, too. Makes it much more palatable for Stu.... and for me. We are well on our way, thanks Leslie. Lots of physio to go yet... but we're getting there. Thanks Iris. Blogging helps. Tough times make the best stories, don't they? Fashion Hyperbole... What's the Story?